Lil dumpling’s second birthday came and went… at lightning speed! We were planning to skip the birthday party and spend the whole day doing what LD like to do the best, that is running around in the open space chasing butterflies, bum bees (bumble bees;) and playing for hours on slides and in swings! But in the end we decided to have a very cosy birthday party, just like last year, with few special friends. And it was fantastic! LD enjoyed this small get-together of people whom he knows and so he was himself instead of looking lost in a jungle of strangers. He was relaxed and happy and so were we! There was no running around and no rushing around too. After a relaxing meal of some delicious Indian meal from our favourite restaurant, we sat around in the kitchen talking till LD woke up from his afternoon nap. And then the birthday boy happily cut his birthday cake and ate big slice of his favourite double chocolate cake. Its different thing that he was seen bouncing off the wall with sugar high till 9 pm, a way beyond his usual bedtime! But the birthdays don’t come every day, is it? After all, the special day comes only once in a year! So we bravely let him be himself and enjoy his day as he wanted! This year though we didn’t buy him any birthday present. Instead we gave him our full day of undivided attention as a present. A day filled with fun, adventure and discovery at kid’s museum. LD enjoyed the open space and ran riot in an open garden with huge sandpit to get all muddy and sandy! Well, it was fun for both LD and us who were seen chasing little tornado sweeping every inch of that park! All said and done, we missed our family a LOT! Irrespective of hours of chatting online, on face time and on phone on wide range of topics (ranging from what they ate for breakfast, lunch, dinner, weather, stock market, exchange rates etc to earth shattering stuffs like Bubbli’s new boy friend, the ice-cream flavour in my favourite ice cream parlour, the latest movie etc), it’s still not the same as sharing happy times under the same roof! It would have been a lot different if our family were around on LD’s special day, smothering him with kisses and cuddles and generally spoiling him rotten with their love! And then there is this thing called food… Oh, the divine food! Now this topic alone can easily fill up over a dozen blog posts (whom am I kidding?! This is a food blog! ), but I will restrain from boring you to death with my rants on anything and everything about food! While uploading the photos of LD’s birthday party to family, I came across the photos which were taken during our trip to India in December. As every other foodie, I made it a point to take few random photos of the foods that we gorged on till our sides burst, just taking enough break to breath in between before we continued to attack on the all the delicious stuffs that our moms made! And then there were other photos of delicious food cooked by our family cook like this and this. Soute kayi and Alasande Majjige Huli ~ Mild and flavourful taste sensation! 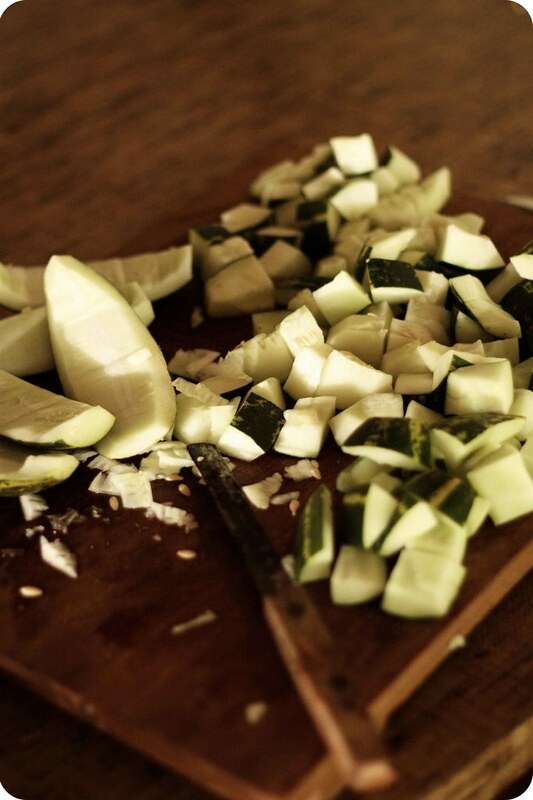 Rinse yellow cucumber pieces 3-4 times and place them in a bowl of water. Usually some yellow cucumbers can be little bitter in taste and rinsing them helps in reducing the bitter taste. 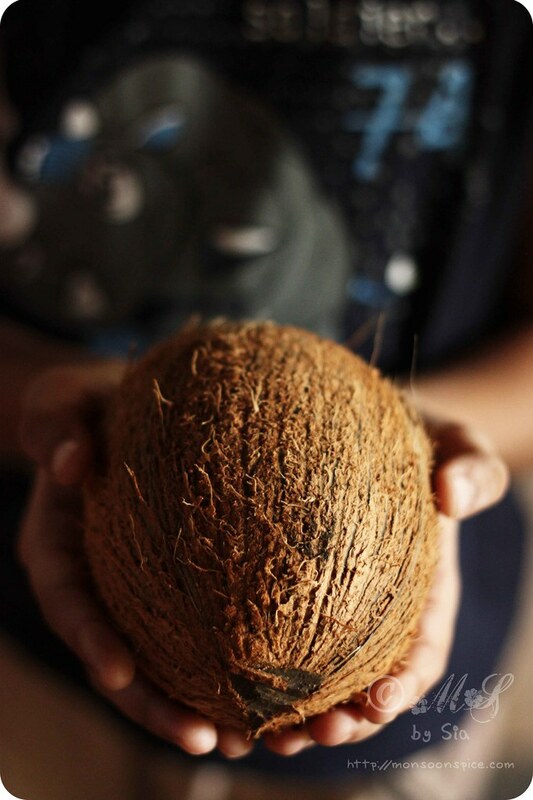 Grind grated coconut to smooth paste by adding very little water and keep it aside until needed. If you like the curry to be little spicy, you can add 1-2 green chillies while grinding the coconut. 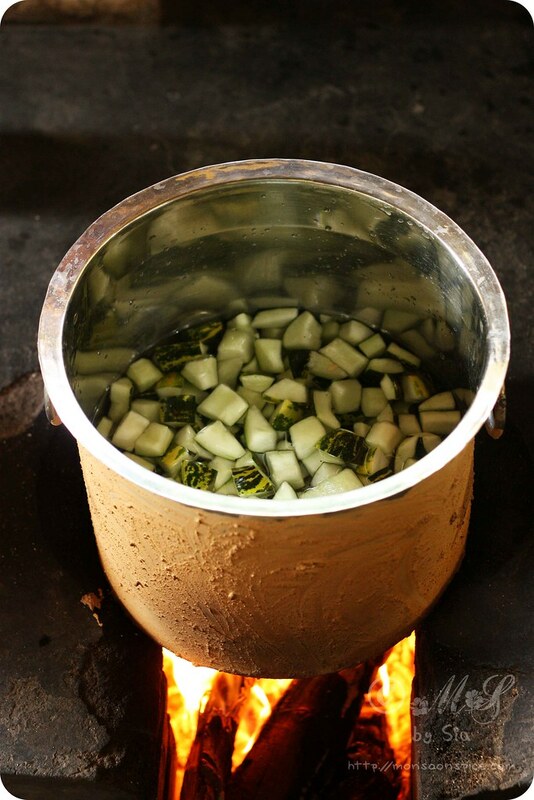 Cook yellow cucumber in 2-2½ cups of water along with tamarind pulp till they are half cooked, about 6-8 mins, on medium flame. Usually some yellow cucumbers can be little bitter and tamarind pulp helps in toning down the bitter taste. Add yard long beans and salt to taste and cook till beans are al dante, about 5 minutes. 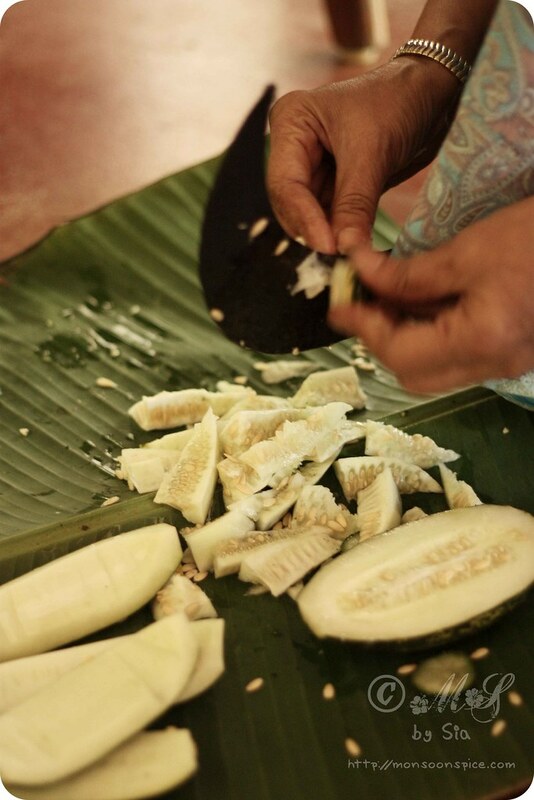 Add coconut paste and cook for 2-3 minutes. Just when small bubbles start to appear, mix in butter milk or thinned yogurt and let it cook for another 2-3 minutes. Switch off the flame as soon as the curry comes to gentle boil. For tadka, heat coconut oil and add mustard seeds to it. When mustard start to sizzle and pop, add fenugreek seeds and let it turn light golden brown. Immediately add dry red chillies and curry leaves and let them fry for few seconds. Transfer the tadka to Soute Kayi and Alasande Majjige Huli and mix them well. Cover the pan with lid and let it rest for at least 15 minutes for all the flavours to blend well. Serve this delicious and creamy Soute Kayi and Alasande Majjige Huli with Rosematta rice or any white rice and pickle and enjoy! Usually some yellow cucumbers can be little bitter in taste and it is best to rinse them 4-5 times using cold water. 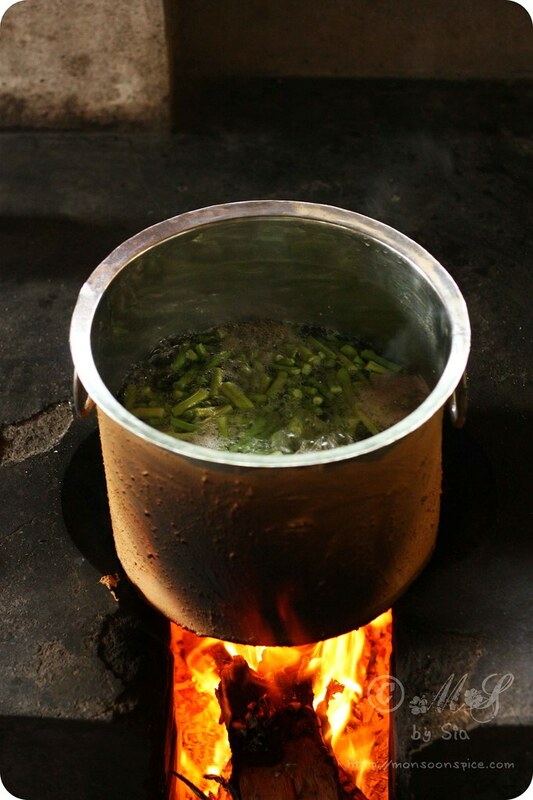 The tamarind pulp added while cooking will also help in reducing the bitter taste. Don’t cook the curry for long once coconut and buttermilk is added as it will curdle the curry and loose its creamy texture. 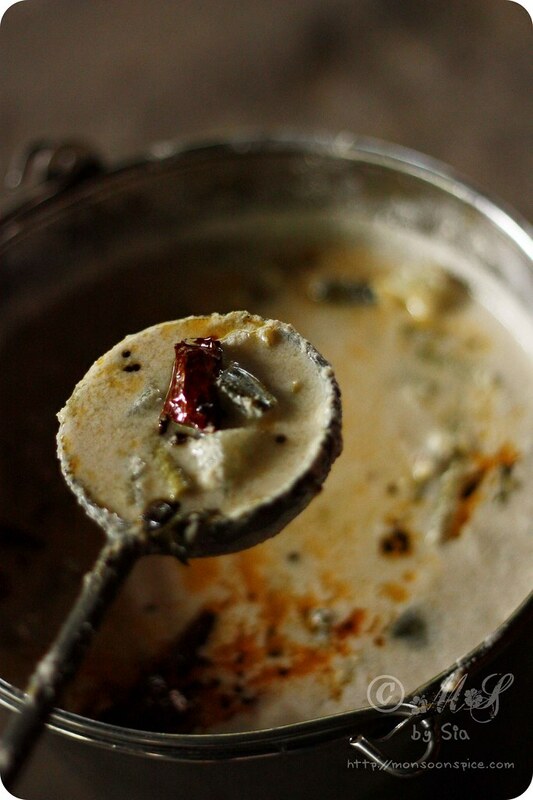 The fenugreek seeds in tadka add great flavour to this Soute Kayi and Alasande Majjige Huli. So try not to omit this ingredient. Beautiful clicks! Your food pictures make me nostalgic.. The vessel on the open fire reminds me of my maternal grand mom's village. If I am not mistaken, the vessel is rubber with mud for easy cleaning and that's how my grandma's cook use to rub the vessels with red mud. She, the cook use to say, this it is easy to clean. Maggige huli looks flavorful & delicious! 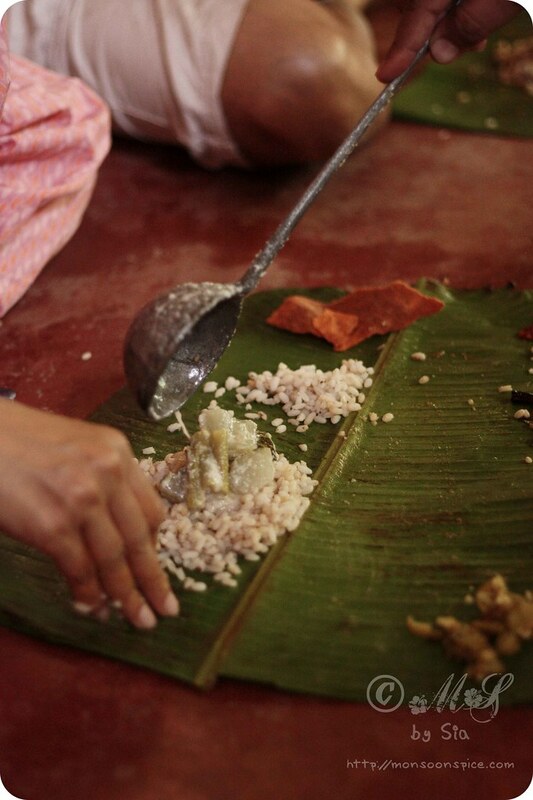 Love the pics Sia,esp the first one.It somehow reminded me of the divine meal we had at Krishna Mutt Udupi. Lovely pictures, nothing to beat the stone ground taste of masala in majjige huli. Belated birthday wishes to your LD. love the pics! 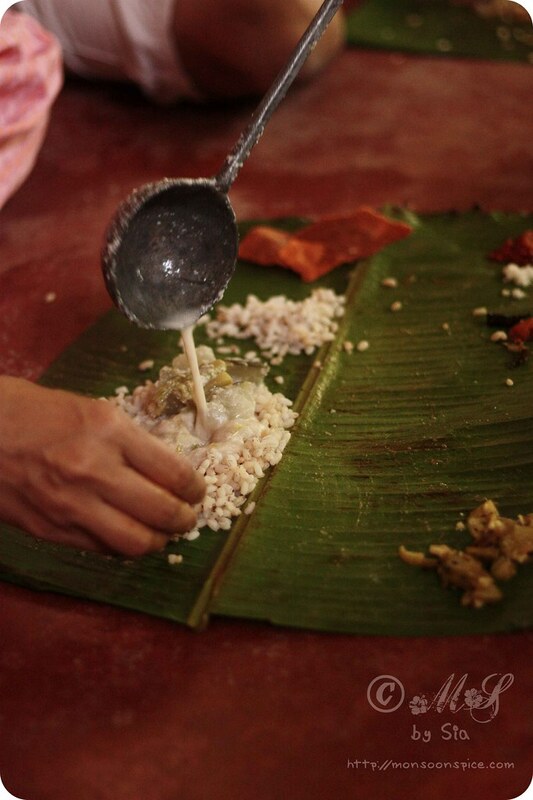 are meals still cooked and consumed like this in your home back in india? @Usha, yes. the vessels are rubbed with mud for easy cleaning :) our elders were clever bunch of people, isn't it? @Nagalakshmi V, these photos were taken at my in-law's farm house. usually when there are many people, this is how the family cook preferes to cook as the vessels are too big to fit in regular gas stoves. Lovely shots of the authentic recipe post!! 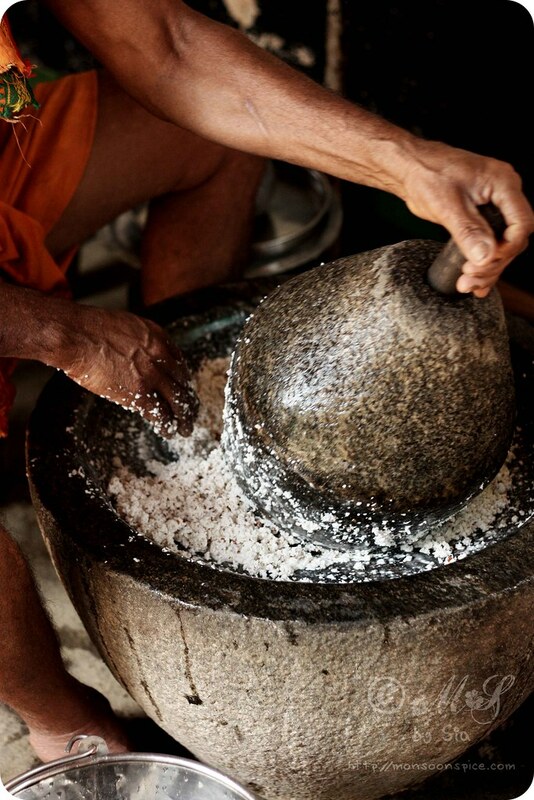 Love the traditional methods like grinding in "aattukallu!" back at my inlaws' place in village we too cook in bronze vessels on firewood as in a large family...these days most of them have shifted to towns/cities.Wish I had started blogging 7-8 years ago!! Wow! I just discovered your site.....it's mind blowing....loved this recipe. 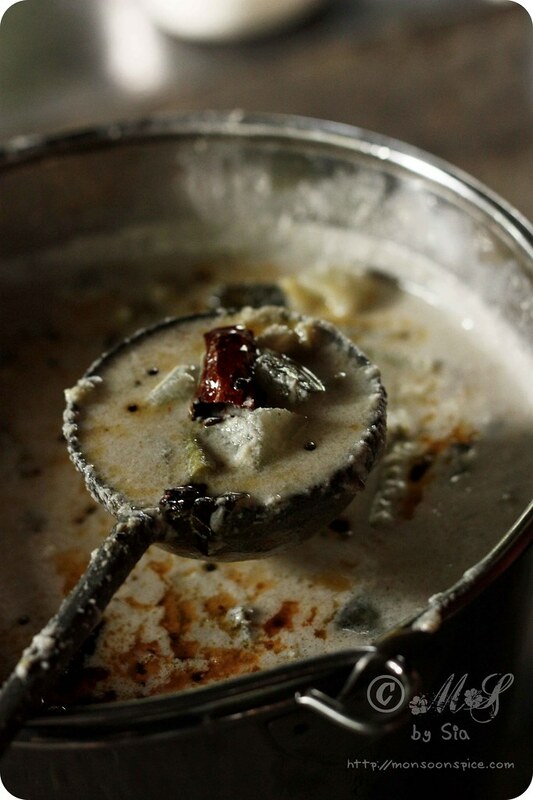 I love South Indian cooking, and this is so mouthwatering. Thanks so much! Gorgeous pictures! Very nostalgic. Never had cucumber in a curry but these pics have made me wanna try it! Reminds me of the majige huli I used to have at my granny's place. The clicks are mouth watering! Me too feel nostalgic when I see the photos..
Dear Sia, you have a collection of adorable recipes. The pictures are great, too. I love the mood of your family kitchen. 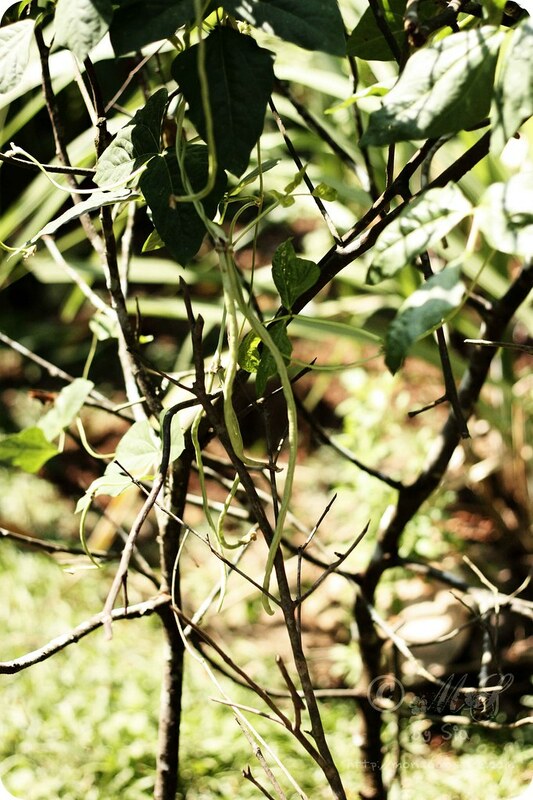 @Lakshmi @Purevegetarian, thank you :) these photos were taken at my in-law's farmhouse and we just love that place.